The gloss black Top Mount Base #46 from Weaver has been machined to tight tolerances for a custom fit. The aluminum base offers maximum strength so that the rings will hold tight. Note: For Savage 10, 12, and 16 short actions; Striker; Pistol; 510; 512; 516 short action; 10 ML (2-piece only) pre-2003 models with shorter tube scopes or red dot scopes use #402 extension front base or one-piece base if available. Extension base allows an extra 0.689". Note: For Savage / Stevens 200 with shorter tube scopes or red dot scopes use #402 extension front base or one-piece base if available. Extension base allows an extra 0.689". Note: For 1.4" diameter Mauser Receiver Ring 98FN and 1.3" diameter Receiver Ring (Swedish 96) shimming is probably required for perfect scope alignment. The rear base may require modifications for correct fit to military actions. Note: The Winchester 52 with the same hole spacing may require bolt and/or safety alterations to function safely and properly. Consult with a qualified gunsmith. Note: The handiest way to pinpoint the correct base for the Winchester 52 & Winchester 70 Long Action rifles is to check the spacing of the tapped holes for the rear base and compare it to the hole spacing for the front base. 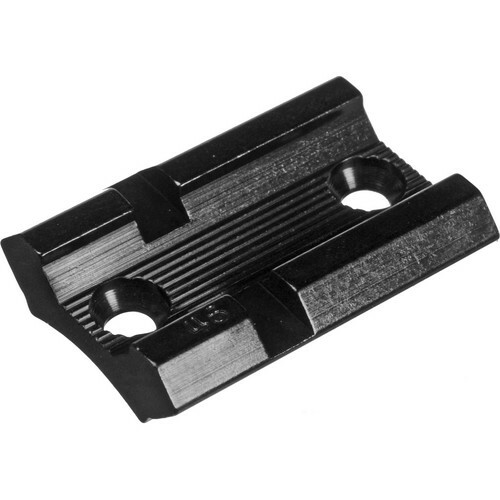 If the hole spacing is the same, then for model 52 use 46+ 46 and for model 52 use 25+ 57. If the hole spacing is different, then for model 70 use 47+ 46 and for model 70 use 49A+ 46. Box Dimensions (LxWxH) 5.0 x 3.0 x 0.01"
Top Mount Base #46 (Gloss Black) is rated 5.0 out of 5 by 1. Rated 5 out of 5 by Simcha J. from Good Base - Solid Mounted these bases to a Savage model 12. This base does what it is supposed to do. I was concerned that the screws would be too long and would interfere with the operation of the action, but it worked out. I used loctite blue to make sure the screws stay. What should I torque the bolts to, to be able to mount this base. I believe that the general range is around 30 in/lbs. for the bases.